The Subscription Options Add-on Pack is a response to the hundreds of comments and emails I’ve had re: the Subscription Options Plugin for WordPress, requesting additional ways to connect and share. 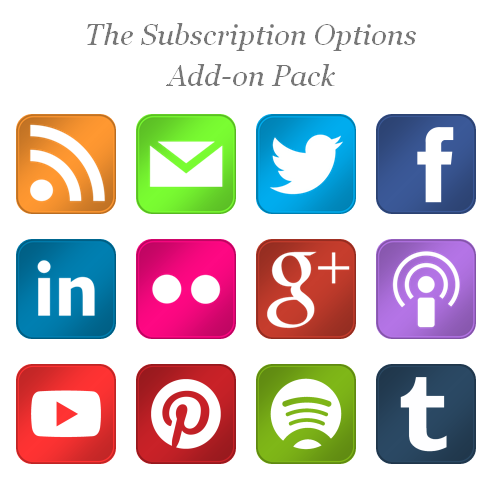 The add-on pack provides additional icons for LinkedIn, Flickr, Google+, Podcasting, YouTube, Pinterest, Spotify and Tumblr. Integrates with the interface, design and functionality of the Subscription Options Plugin. Offers an additional set of ways for readers to subscribe and connect with your blog, via familiar-looking icons. To download and use this add-on pack, please make your purchase right here. Once your order is processed, you will automatically be emailed your download link. Download & extract the files and place the entire ‘subscription-options-addon’ folder in your wp_content/plugins directory. Go to your ‘Installed Plugins’ panel and activate ‘Subscription Options Add-on Pack’. Check to see whether the original Subscription Options Plugin needs upgrading, and if so, upgrade it to the latest version. You are now ready to use the add-on pack. Go to your ‘Appearance > Widgets’ panel and you will notice a new set of options in the Subscription Options widget. – Please note that you don’t need to use all the icons, just don’t enter a URL if you don’t want an icon to show up. 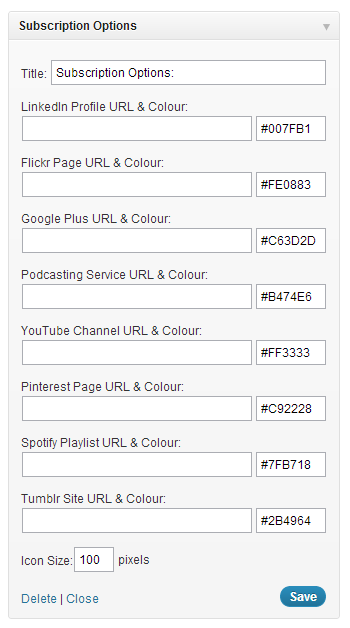 – Please also note that you can use any HTML colour code, be it HEX code or HTML Color Name. Hit ‘Done’ then ‘Save Changes’. Test the appearance and perhaps change the size of the icons as necessary. *Not pictured above are the standard four icons, which would usually fill positions between the Title & LinkedIn options. V 0.1 – first version with options for four new services. V0.2 – new icons – as promised! V0.3 – potential for even more icons, based on user feedback. Can I style the new icons in my own way? Please note that the icons’ sizes will still need to be set from within the widget admin panel. CSS doesn’t let you override that that. Why don’t my icons have nice rounded corners any more? The latest versions of the base plugin offer thousands of new colour options, using transparent icons and CSS3 rounded corners. As such, the widget looks best in modern CSS3-compatible web browsers such as Firefox, Google Chrome or IE9. If you are not entirely comfortable with this, you can always roll back to an older version of the original plugin (but you won’t get the new icons showing up). How do I get my Google+ URL to look like yours? I suggest you check out gplus.to, which will let you do just that. How do I set up a Podcast or Podcast URL? Feedburner can help, as can Apple. Podcasters, please post your links in the comments below as I’m always on the lookout for new ear candy! What should I put as the URL for the Spotify icon? Well, I put a link to my Starred Tracks, like this http://open.spotify.com/user/freedimensional/starred. Just email me from my contact page, or leave a comment below. I’ll be happy to help where possible. How can I support this plugin’s development? Simply buying it would be more than enough. The ‘buy now’ page is right here.